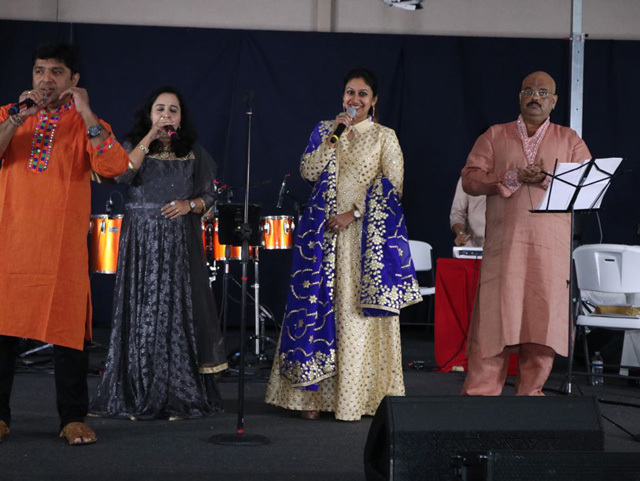 Gokuldham Haveli in Atlanta, Georgia held its first Navaratri Utsav beginning on October 10, 2018 and lasting all 9 days of the Navaratri Hindu festival, in the presence of Shree Yamuna Maharani’s idol. Entry and parking were free. Playing garba and dandiya in the presence of a wonderful music group from Mumbai under the outdoor tent provided a unique experience that attracted big crowds of Indian-American Gujarati families. The first day also featured Goverdhan Puja, Annakut, and a fireworks show. On the first two days, everyone was inside the Jagat Guru Hall. 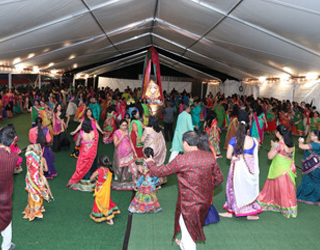 Then for three days (Friday, Saturday and Sunday), the Navaratri Utsav was held in the parking lot in the soundproof and waterproof tent with green carpeting. This was nostalgic for the community as it reminded them of playing garba and dandiya in their hometowns in Gujarat. All age groups participated. The musical group from Mumbai led everyone in various styles of garba, such as dodhiyu, 2 claps, and 3 claps, and Bollywood music dandiyas also added to the fun. A variety of food counters provided tasty food to the players. Since Diwali follows Navaratri Utsav, the haveli was lit with colorful lights and looked beautiful at night. Thanks to the many volunteers who helped to make this event successful, especially Gokuldham Chairman Ashok Patel, Secretary Tejas Patwa, Bobby Patel, Kintu Shah, Samir Shah, Hetal Shah, Parimal Patel, Nixan Patel, and Alkesh Shah. This is second video for Gokuldham Garba day 1. Gokuldham Haveli in Atlanta, GA is constructed with an inspiration of HDH Shasthpithdishwar Goswami 108 Shree Dwarkeshlalji Maharajshree of Vadodara, Gujarat. Apart from being a Hindu vaishnav temple, Gokuldham is also on the forefront at organizing various cultural events to serve the Hindu community in Southeast USA.